← Saturday 5th September 2015 – Book signing at a charity summer fair in Croydon. This weeks looks like it’s going to be lovely and sunny!! I’m so excited, we’ve not seen the sun like this for quite some time. I could spend as long as I wanted playing today, so spent about 4 hours in total before my back was telling me enough was enough and it’s time to go home. I started in the best place of all, which is at the beginning, and continued where I’d stopped on Friday in the Asparagus bed. I’ve now weeded it all and hopefully it’ll stay weed free for quite some time. 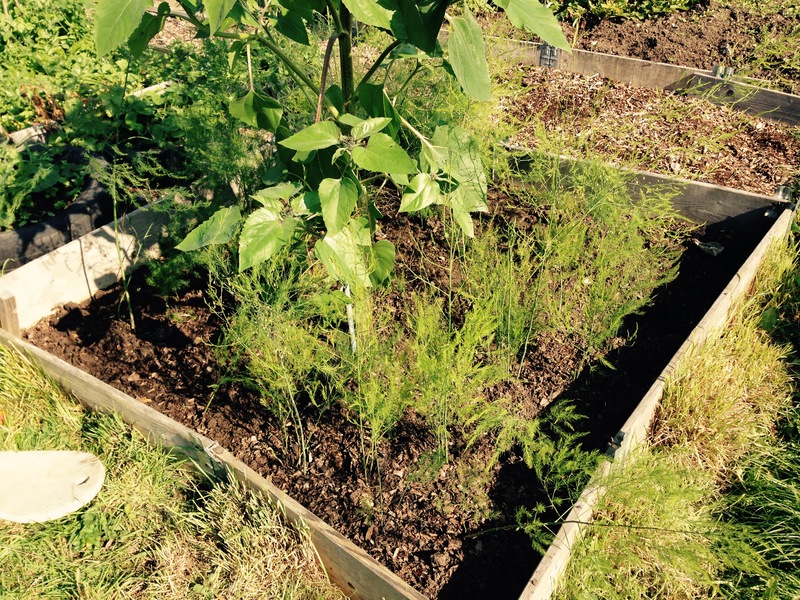 Asparagus doesn’t like to be surrounded by weeds and likes room to breathe. Asparagus bed all clean and tidy. 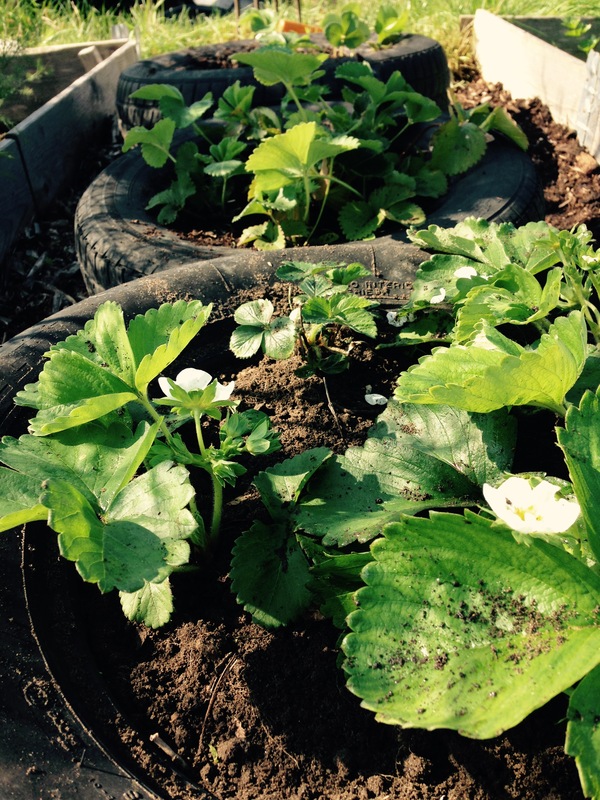 I was able to work systematically through the beds today so the next job was to weed the Strawberries in the tyres. I took some runners that had rooted themselves in the wood chips on the paths, and I’m slowly taking those up and moving them. It’s taking a long time because there are so many of them, but I’ll get them all done eventually. They seem very happy in their new home. Looks like I may get a late flurry of Strawberries!! 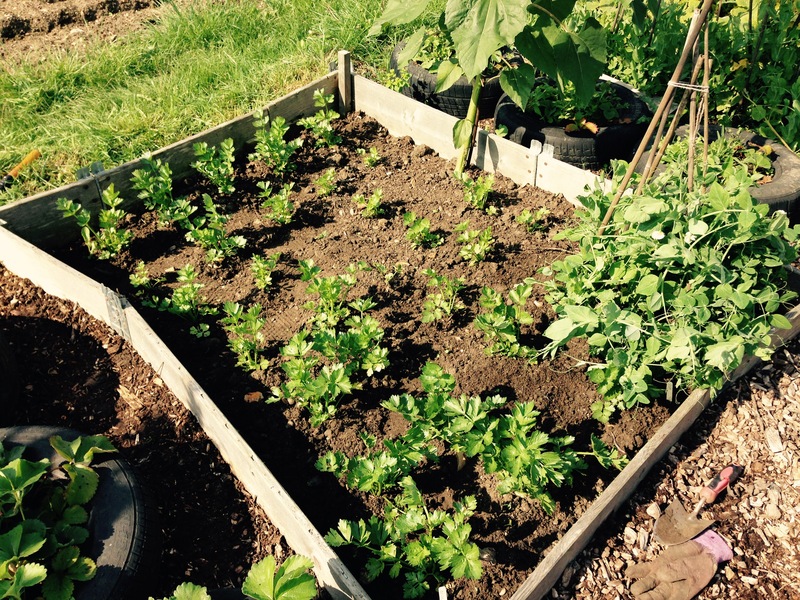 Then it was onto the Celeriac bed. Now I’m not expecting great things from this because it went in very late, but even if I get a few decent sized ones then I’ll be happy. It was fairly easy to weed round these, but I’ve also got a little wigwam with some more Peas growing up some canes. Weeding this is rather tricky as the plants are so thick and they’re all snuggling together. But the soil is soft, so any weeds could be pulled out quite easily and without disturbing the roots of the peas. This years Celeriac. Yes they may be small, but hopefully I’ll get something. Once this bed was finished it was lunch time, so as I walked up to the tap to wash my hands (they were very dirty), out from my Pumpkin patch shot a fox!! This had been dozing very happily under the leaves for goodness knows how long. Whether it was the same fox that I saw on Friday I don’t know. As I was having my lunch it pootled back to its cozy spot again and I found it again. Bloody cheek!! Obviously it’s found a cozy place to rest, I’ll just have to watch out incase it’s there again. After lunch I weeded the bed where the Butternut Squash are growing quite happily. In this patch (I have another in a different area) there are about 8 good sized ones growing. This year has been really great for them. I won’t harvest them until the leaves and stems have all gone brown. Their skins are hard so won’t mind a bit of temperate weather. Just make sure you get them in before the first frost and store them in a frost free place. 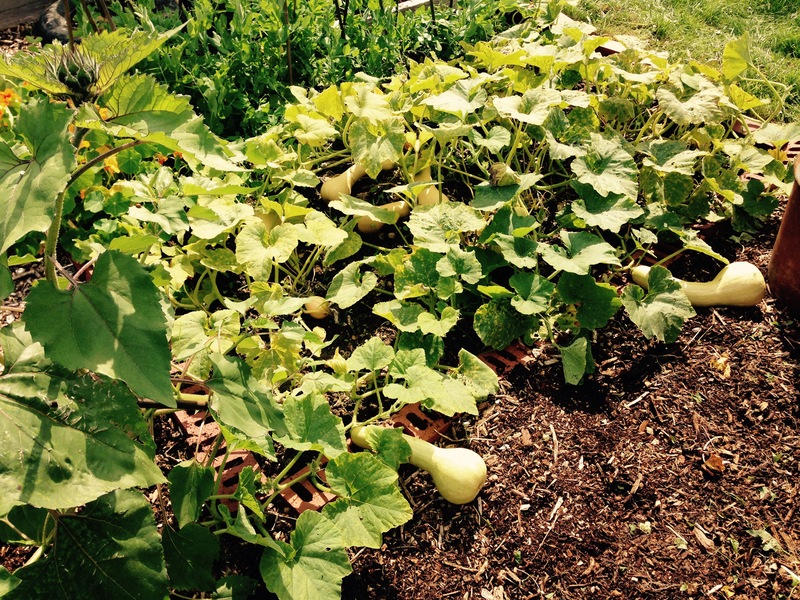 My Butternut Squash are growing very well. Yes they’re rather strange shapes, but they’ll taste just as good. Now I know it’s only September, but I’ve already asked Father Christmas for a very specific present. Mark said if I was good then maybe I would get it. I’m always good (if a little naughty sometimes). My poor garden shears have broken. A piece of wood from the handle has broken off and the plastic end has gone somewhere. I’ve tried to tape them back together, but it just doesn’t work. Still they’ll do until Father Christmas visits on December 24th. Well that’s it for today. A good 4 hours work. Time now for a cup of tea and a brief sit down. This entry was posted in Uncategorized and tagged asparagus, butternut squash, celeriac, claire's allotment, fox, peas, pumpkin, strawberries. Bookmark the permalink. 4 Responses to Monday 7th September 2015 – A glorious day. My chickens love a little treat, and they deserve it because they work hard laying eggs for us. I bring them something home every time I’m on the allotment. I’m so glad you’re planting Celeriac. It’s really easy to grow and I’ve never had problems with bugs. Let me know how you get on with it. Just be aware that the roots go on and on, so it’s quite tricky to get all the soil out. I’ve never planted Parsley root before. It’s on the list of plants to try. I’m sure I’ll get around to it in a couple of years.